Classified By: Ambassador Donald Yamamoto for Reasons: 1.4 (B) and (D). ¶1. (C/NF) SUMMARY. On January 31, Assistant Secretary Frazer met with Ethiopian Prime Minister Meles Zenawi in a broad ranging 100 minute discussion on Kenya, Sudan, Somalia, Somaliland, and the Eritrean border. Also in attendance were Ambassador Yamamoto, Ambassador Courville, Sudan S/E Williamson, AF/SPG Director Lauren Landis, and notetakers. A/S Frazer opened by noting that Kenya is in a dangerous position, but that both President Kibaki and Raila Odinga have the potential to reach a settlement. Meles assessed that both sides were playing hardball and that the international community should place greater pressure on the opposition to reign in the violence. Meles said the key challenge in Sudan was to manage the North-South tension to avoid a meltdown in 2011. Regarding Somalia, Meles said that his government had developed a three track approach to be presented to President Yusuf on Yusuf’s return from London. First, Meles said he hoped Ethiopian troops would withdraw from Somalia by summer to be replaced by African Union and newly trained Transitional Federal Government (TFG) forces. Second, his government would reach out to the opposition within Somalia, and third, his government would reach out to the external opposition. On Somaliland, A/S Frazer and Meles agreed that they were not opposed to formal recognition, but that the African Union should take the lead. Meles said that Ethiopia would not drop out of the Algiers Peace Accord process and that sufficient changes had been made in UNSC resolution 1798, but he added that the Eritrea-Ethiopia Boundary Commission’s (EEBC) “virtual demarcation” decision should not be supported by the UN. Lastly, Meles said the United Nation’s Mission in Ethiopia and Eritrea (UNMEE) could move in its entirety to Ethiopia if UNMEE was forced out of Eritrea. END SUMMARY. ¶2. (C/NF) The meeting opened with an hour-long tour d’horizon on the repercussions of the Kenyan elections. Assistant Secretary Frazer began the discussion by noting that Kenya is a dangerous situation, and not just as a local or national problem, but also an international concern in light of the terrorist presence in Kenya that might seek to exploit the situation for their benefit. A/S Frazer said that she thinks both Kibaki and Odinga have the potential to be reasonable and reach a settlement. A/S Frazer noted that the impact of the violence includes the loss of foreign business and investment, as well as the loss of the U.S. Peace Corps presence. ¶3. 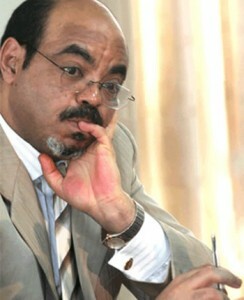 (C/NF) Meles said that he feels that both sides are playing hardball, and agreed that the situation is very dangerous. Meles said he was not sure what happened with the elections, but feels that Kibaki had been more accommodating in the beginning and has hardened his position as the situation has developed. A/S Frazer responded that the hardening of Kibaki,s position is because of the post-election violence. Kibaki saw Odinga as responsible for the violence and felt that he could not trust Odinga, which caused him to harden his position. However, A/S Frazer said that Kibaki may be in a better position to bring stability to the situation. Kibaki has the power of the state behind him and is the only decision-maker on his side, while Odinga is one of five making the decisions. Odinga is probably the most reasonable of the five, but he is constrained by the hard-liners within his coalition. For example, William Ruto presents one face to the international community, but then turns and uses the radio to incite violence. ¶4. (C/NF) Meles opined that the opposition has been given a free ride; all the pressure has been on President Kibaki, not the opposition, even though they are responsible for most of the violence. This is giving the wrong message to the opposition. Kibaki,s government, even if it has not made good decisions, has not incited violence. A/S Frazer noted that it is difficult to have leverage over the opposition, since the natural leverage of a government is over another government, rather than an opposition group. The United States is advocating a message of accountability on all sides, both government and opposition. A/S Frazer noted that some Kikuyu politicians are beginning to use the Mungiki militia to retaliate against the violence carried out by the opposition. ¶5. (C/NF) Meles noted that the opposition used the perception that the government had stolen the election to incite violence, but the main violence and victims of attacks were in the rural areas, not the capital. Meles said that “none of us spoke strongly enough against the ethnic cleansing” that was taking place in the rural areas. Now the “Kikuyu establishment” is using militias, such as the Mungiki, to retaliate in a “payback period.” It has to be made clear to the Kikuyu establishment that ethnic cleansing is unacceptable as a response to the violence and that they cannot “fight fire with fire” or use militias to fight on their behalf. ¶6. (C/NF) A/S Frazer responded that the U.S. message is the same: ethnic cleansing is unacceptable and all sides must be held accountable for the violence. However, A/S Frazer noted that this is difficult because Odinga is an excellent communicator and very good at playing the victim and the media love the concept of the “good guy” versus the “bad guy.” A/S Frazer said that she feels that the situation must be resolved quickly, particularly before the U.S. Congress and UN Security Council come back into session and begin to focus on Kenya, when the challenge will be to fight a battle against overreaction. A/S Frazer emphasized that the U.S. focus is on the process led by former UN Secretary-General Kofi Annan and that the United States will follow Annan,s direction. Following Annan,s lead will also help keep the U.S. Congress from overreacting to the situation. The key is a negotiated political agreement, which will then influence the international response. ¶7. (C/NF) A/S Frazer said that it appears that Kibaki is trying to consolidate power, while Odinga wants to internationalize the conflict and maintain a state of crisis. There is a danger that the situation could lead to civil war. A/S Frazer noted that Secretary Rice had recently spoken with Annan, and Annan mentioned that he had suggested to Kibaki that he bring the military out in a limited way, but that Kibaki demurred based on concerns regarding ethnic divisions within the military. If the ethnic divisions become more pronounced because of the violence, A/S Frazer expressed her concern that it could lead to a coup d,etat. The Kikuyu response could lead to civil war, as many Kikuyu fundamentally don’t believe that the election was stolen and are incensed by the violence that the opposition is encouraging. ¶8. (C/NF) Unfortunately, Meles responded, the international reaction thus far does not inspire moderation. The EU response of cutting off assistance gives the message that Kibaki is the “bad guy” and does not push Odinga or his group to moderate their positions. While the military may not quit, they will not be monolithically behind Kibaki, which is why some Kikuyu are turning to the militia instead. The “single-minded focus on Kibaki” is not productive for a peaceful settlement and will only entrench hard-liners on both sides. Meles said that a more balanced approach is needed to encourage a peaceful process. ¶9. (C/NF) A/S Frazer said that she personally believes that Kibaki could change the dynamics single-handedly overnight with a public address that is not defensive but a true “Mandela moment.” Until this point, Kibaki has been “stage managing” his presidency, but needs to be more substantive in his messages to the people. Kibaki must also control his supporters, some of whom have tried to undermine his positive efforts towards compromise. A/S Frazer noted that the opposition prefers the term coalition to government of national unity, which they already tried in the past and did not work. A/S Frazer also opined that the government could improve the situation by lifting the restrictions on the media and asked the media to behave responsibly, which could have the effect of making the opposition look very small in comparison. ¶10. (C/NF) Meles agreed that Kibaki is not violent by nature, but has only been going after the foot soldiers, not the organizers of the violence on the Kikuyu side. Meles believes this is because Kibaki can only rely on a “100 percent Kikuyu institution” that includes the “bosses” that have organized the Kikuyu-led violence. This puts Kibaki into a dangerous situation if he reaches out to the opposition without guarantees that they will respond positively. A/S Frazer responded by noting that Odinga,s heart is not in violence and would be likely to accept a compromise. However, it is not clear what kind of deal he might agree to take. But by reaching out, A/S Frazer said, Kibaki could place the media pressure on Odinga to agree, rather than keep it on himself. ¶11. (C/NF) Meles said that it would be helpful for the United States, in coordination with the EU, to speak to both the opposition and key Kikuyu figures in clear terms regarding accountability for the violence. Meles said that he planned to meet with Kibaki at the AU Summit during an IGAD meeting on the margins of the Summit. Meles emphasized Ethiopia’s direct stake in the situation in Kenya and that Ethiopia “cannot sit idly by” or afford further instability in Kenya that could impact the broader region. While “we should not pour oil on fire, we must understand where Kibaki is coming from, and that he has to be seen to defend Kikuyu interests” and keep his Kikuyu base. Meles promised to follow-up via Ambassador Yamamoto following the IGAD meeting. ¶23. (U) A/S Frazer cleared this cable. The Kenyans people from the beginning had no problems with tribes.The tribes knew each other with respect to one another, because we respected our customary dealings, and no one interfered with one’s believes.That is why the British Colony gave us boundaries to guide us and named the areas(Regions)along side tribes.And that is why KADU party wanted “Majimbo” not to interfere with other region’s culture. Now when Kenyans attained Independence they thought if they give one of their son Jomo Kenyatta who was in detaintion could bring peace in the Country but all were in vain. Kenyans agreed how they can Govern themselves peacefully,but the same were thrown in dustbin.Kenyatta ruined Kenya because of his tribal selfishness leadership, and tried to eleminate other tribes who ought come up to the level of leadership.That should be noted. He did what he could do except the death stoped him.That was the thinking of Central Province Kikuyu tribe people in Kenya.He acquired what he wanted and kept it forever.Everything was to work as a family business.Nepotism, impunity, corruption and bribes were the daily business of Kikuyu tribe. Now the second President Daniel arap Moi from Rift Valley Province a Kalenjin tribe followed the same style namely Nyayo(to follow the same steps)to eleminate whoever ought be a leader in other tribes,Robert Ouko and others are an example. All Presidents were covering Kenyans with the “Peace” Blanket to make people sleep too much with negative Peace.Nothing changed, impunity, nepotism, corruption and tribalism reigned in Kenya as a Kalenjin tribe. The third President from Central Province a Kikuyu tribe the second Kikuyu President Mwai Kibaki came in with a blanket namely “Hope” to cover Kenyans to believe that he will do better and bring Hope but all in vain. Kibaki in Kenyan History is the worseiest President to allow his tribes men to loot and do what they want in Government’s name while he pretend as he knows nothing. A Very high standard of corruption to loot the taxpayers money through Commissions and other means of tactical pretances.The Hope in Kenyans went in vain. Kibaki want his tribe to be the only Kenyans Government, when he tells the World leaders about Kenya, the World leaders think he is talking about Kenyans while he means (Kikuyu)Kenya Government instead of all Kenyans Government in Coalition (Grand Coalition Government) of ODM & PNU two Principals sharing powers 50/50 with Consultation in motion for Kenyans but not for PNU Kukuyus Government? Now my open warning to President Kibaki is that he should make Kenyans love each other as a one Country men and women and bring peace to the people of Kenya regarless of their tribes. Kibaki should exclude the Kenyans Government from the perpetrators of 2007/08 violence to which many people lost their lives and many displaced up to this moment.The six individuals named should face ICC Hague to answer questions without any involvement of the Kenyan Government or UN Security Council which prosecute the Humanrights violators. How can he involve a such organization which makes peace Internationally to put it in his evil acts? He must let the six face the ICC case as individuals, if he is involved himself with them then he should tell Ocampo to include him to join them than to involve Kenyans Government into that dirty mess. But if he incite Kenyans to bring Chaos in the Country he will harvest very heavily. He should not be blinded by his Army or Mercenaries or Mungiki. Kenyans have sons and daughters who can fight the Civil War he is planning to be. Other tribes have also fighters. Mungiki can not match with a small group namely (Musumbique)Musumbique can crash Mungiki within a day but they were stoped by their good thinking tribal leaders not to do evils to people, but if they could be allowed as Mungiki are allowed, Kenya can see fire or ash.Please don’t try to incite Kenyans to think what you are thinking on leadership in Kenya. Let Kenyans elect their leader through the new constitution by vote. Leadership in Kenya is for every tribe to try peacefully not by force or money. Kenyans know who can be their President not that nonsense we hear of succession. We don’t have inheritance laedership in Kenya. Let the CIC Chairman Charles Nyachae and his team implement the new Constitution in the manner which all Kenyans wiil be happy to lead them. Do not blindly put in your impunity, corruption and nepotism in this new laws otherwise Kenyans will throw your tribe in the Hell of fire for ever. If I am wrong on that try it and see.